Inspired by the Traveller Out-of-the-Box posts on the Tales to Astound! blog and makofan‘s post on the OD&D Discussion forum, what do you think of our chances of putting together a subsector based on the 1977 LBBs? I know we’re a small community, but the recent one-page setting contest seems to show there is enough will and talent here. The only question is whether you’d all be interested in doing something like this for old-school CT. The idea is that I would prepare the blank map using only the random method in LBB3 (including ’77-style space lanes), and everyone would take it from there to develop their own clusters or individual worlds (in communication with your neighbours if you feel so inclined – we found this was the most fun part when we developed the Spica Sector for Spica Publishing years ago). This is the way it is supposed to work people get inspired to DIY whatever they want by something here and something there! If you have a passion, keeping posting - you never know who or what you may inspire in this wide spread hobby of ours! This project is down in our Rules/Campaigns Projects forum and is titled Space: 1977. I have been meaning to write about BLUEHOLME™ for sometime now, but had never gotten around to it. So now the time is "write" and away we go. There are many other games I want to write about and, time permitting, eventually I will. There is no particular order in which I do these things nor is there any particular order to when and which blogs I highlight. I just go as the winds of the cosmos move me. reading all about it, I was shocked, nay dismayed, to find that there has never been a legitimate OGL clone! This must make it unique among the editions. And so, in just a short while, I will give you – BLUEHOLME™, the Free Fantasy Adventure Game, for 1st to 3rd level characters! By that point he was already thinking of the BLUEHOLME™ Compleat Edition which would cover play above third level. Then on 24 November 2012, he posted this update, BLUEHOLME™ Prentice Rules: Spells Preview as he was trying to get it finished and up at RPGNOW for Christmas. He did get it uploaded before Christmas and then had a little bit of fun getting it moved to active status so people could get it, and it went live on 10 January 2013. He also released BLUEHOLME™ The Maze of Nuromen an introductory adventure. This is an easy to play, simulacrum of a hotly debated D&D transitional system. I'm still flipping through my copy. Impressive. A worthy addition to the collection - looks pretty loyal to the J Eric Holmes ruleset. Now... the only thing missing is some ole players from 1982 and a print-on-demand version :-) Have a look and see what you think. ...every review that I write (maybe the word "review" is wrong; "educated opinion" is more accurate) is inspired by that work in that the work actually managed to inspire me to write about it, rather than it just being something I've read to review. The presentation is clean and neat, the ruleset exceptionally clearly defined and well-organized. ...but yet retains a solid feeling of uniqueness and character that feels scholarly and sophisticated, as if high-brow-ifying Holmes Basic. And why not? Why can't the scholarly effort of Dr. Holmes to clarify OD&D be celebrated in a sophisticated, erudite retroclone? In fact, if Dreamscape Design ever does the Prentice Rules in POD, I will be one of the first guys in line. In fact, I'll take two. At least. I find myself in agreement with the above reviews, it is indeed very well done. Art work by Mr Jean-Francois Beaulieu. BH1: The Shrine of Sobek, will be a (free) stand-alone module featuring a step-by-step example of those rules in practice. The contents of the latter as of this moment feature a small beginner’s Underworld maze, a campaign map and a section of the Wilderness between the Shrine and the character’s home base, and the base itself: Blueholme, a small frontier port town at the north-western edge of the Realm. As you probably know by now, the Holmes manuscript revelations on the Zenopus Archives Blog have set up a mini-earthquake in the BLUEHOLME™ Compleat Rules. On 25 November, 2014 he receeived his proof copy of the softcover POD version of BLUEHOLME™ Prentice Edition 2nd printing and by 19 December 2014 they went on sale at Lulu. Then for the next several months updated are published concerning all of the projects that the author has underway. On 30 December 2015, he tells us the Compleat edition is nearing completion with the help of many proofreaders and play-testers, along with more original art to complement the cover. Yea, play-testers; how cool is that. 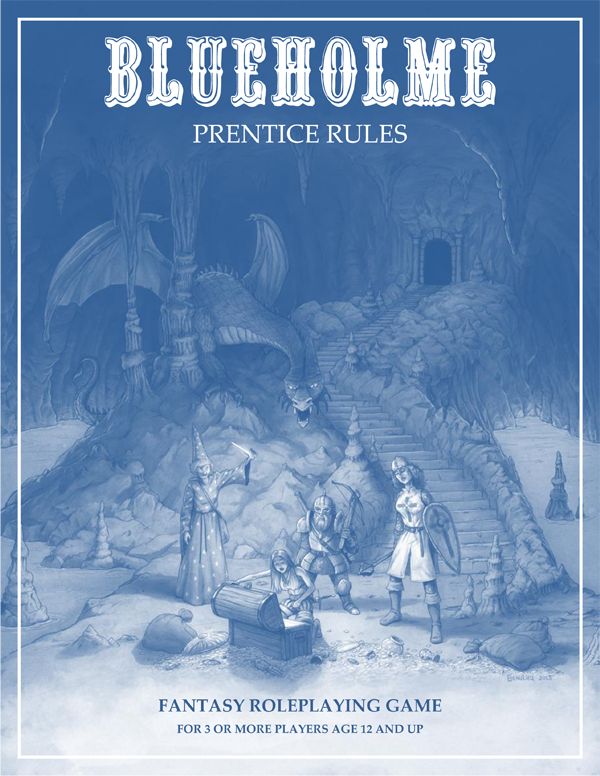 Then on 26 March, 2016 he announces that there will also be forthcoming a BLUEHOLME™Journeymanne Rules that will be somewhat in between the Prentice and the Compleat Rules. As an aside in early Feb 2016 Kickstarter was run for a game called The Black Hack (based on OD&D - but ultra light) and it was released on sale as of 23 March 2016. Our BLUEHOLME™ author was intrigued and started working on a little experiment called BLUEHACK™ which is a mashup of Holmes D&D and The Black Hack. 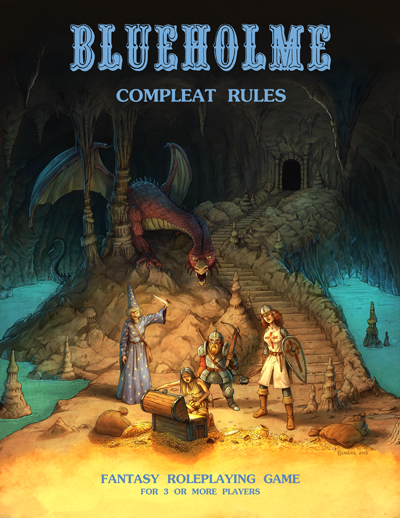 As I write this it is my understanding that BLUEHACK™ will be released in the not too distant future and then we should find out about proposed release dates for the BLUEHOLME™Journeymanne Rules, BLUEHOLME™ Compleat Rules as well as the modules that are also in progress. Again I am really impressed that play-testing is being done and that our author is also working a full time job, is married and has a family. I look forward to his next update as I also await his new products. Something that I think everyone who runs an old school OD&D game or other game and creates you own stuff, is always searching for ideas and trying to create new things to keep the game fresh. We all have our own methods of doing this. In between games I read everything I can make time to read. I take a thread of a theme or idea and I pursue that, tracking down everything I can learn about it. I think and meditate about it. When I am driving to work and back I often run ideas back and forth in my head to find the ones that grab me. I try to get them written down as soon as I can. I don't know about you, but I am at my most creative in the game as the referee. My mind works best when I have to create on the fly and I like it when my players do something crazy and unexpected and strike off into the unknown. Let me point you to the blog Telecanter's Receding Rules and his essay titled Generating Ideas. It's counter-intuitive, but putting constraints or boundaries on a topic is helpful. Once you start producing ideas, you can look for patterns in them that you can then use to come up with even more ideas. This whole post is based on the idea of logically figuring out how we generate things and then using it. I hate the word inspiration. You don't have to get the whole idea on the first go. The more we do this kind of generating, the easier it is to produce things in these ways. Go check out his essay, and let me know if you know of other essays on the subject, if you please. I have been following the game Treasure Hunters by Scott Anderson for some time and I believe it is time to post an update. Treasure Hunters Prolix Edition final edit has been released. Treasure Hunters Players Rules was released on July 10th, 2016 and Treasure Hunters Referee's Companion was released on July 11th, 2016. Right after that he started on Treasure Hunters Basic Edition and he released Treasure Hunters Basic Odd Men & Monsters as a prelude to the new edition. Then on August the 5th he updated the project and Treasure Hunters Basic is now MYTHICAL JOURNEYS and the current version of the work in progress Mythical Journeys Adventure Game is made available for your perusal. He also in this most recent post critiques the game and notes some of the changes he intends to make. Check out the game and if you are moved to give the author some feedback. A sample image from the soon to be published El Raja Key Archive DVD has been posted by the author (Robert J Kuntz) at his blog here. The sample image is from the "Ruins of Seer" a massive Greyhawk Adventure written BitD (1983-1985) by Rob Kuntz but never published. This is just one of 1100 files on the DVD. 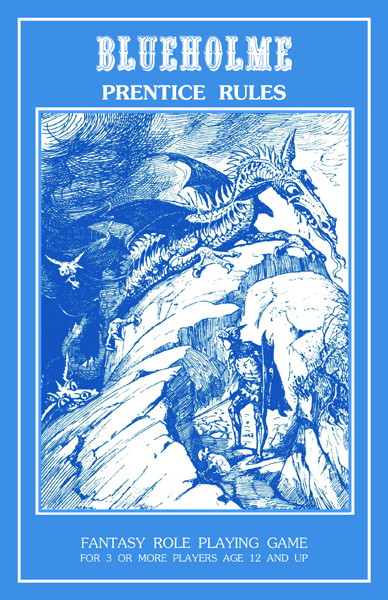 Six More Public Domain OSR Resources For Your Old School Campaigns. I hope these things inspire you to take all of this and put your own twist on it and make it your own for you campaign. When you do remember these two fellow travelers and raise a toast to them. I received the following most recent update from Rob about the "El Raja Key Archive" this morning and with his permission I am quoting his entire message here. Thanks to all those who showed interest in this project. It is one or two nights away from being completed. The interface is really cool, with a splash page of my Castle El Raja Key, a great cascading view to view thumbnail image files and choose amongst them, hype-linked files, and over 50,000 words of descriptions, Preface, Forward, How to Use, etc. It's been one hell of a project that stretches back to its earliest file which is dated 1971. I know everyone who appreciates the History of D&D and the earliest items and facts associated with it will enjoy this product for years to come. To which I say, Wow!! 50,000 words just for the descriptions of files and they date all the way back to 1971!! I am looking forward to checking out all 1100 files.